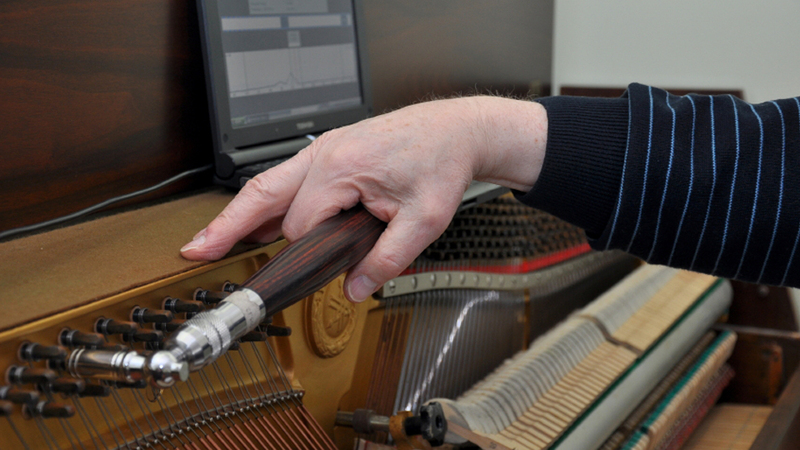 Types of Tuning – When you make your appointment to have me come and tune your piano, the ﬁrst thing Iʼll do is measure your piano to see how far out of tune it is. How out of tune the piano presents will determine the approach needed to return the piano to standard pitch. Fine Tuning – This technique of tuning can be used if the piano presents as being barely out of tune, 1/16 of a step or less. Stretch Tuning – The piano has moved more than a 1/16 of a step but presents in such a fashion that a pitch alteration is not needed. Pitch Alterations – When a pianoʼs pitch has moved substantially sharp or ﬂat, some form of a pitch alteration is needed to help stabilize the instrument. A pitch raise is needed when the piano has fallen ﬂat. A pitch down is needed when the piano has pulled sharp. There are varying approaches to take with pitch alterations depending on how the piano presents. Regularly scheduled maintainence tunings are the key to having your piano presenting at its best. How out of tune the piano presents will determine the cost of tuning. The more in tune piano takes less time, the lower the cost. The more out of tune piano takes more time, the higher the cost. The difference is time. It takes less time to tune a more in tune piano than a way out of tune piano. Call 919 260-8860 or email us now to discuss your individual piano needs and pricing. Make an appointment today.